"Installation of the unit costs less than half that of an equivalent solar power plant and occupies an area of just 200 square meters, compared to 50,000 square meters for solar and 5,000 square meters for wind power," Fernando Lindoso, the director of the company in which he is a partner, told IPS. In addition, it has the advantage of stable generation, "free of the intermittency of other sources," said Lindoso, who estimated the cost of each 3.5 MW unit at around five million dollars, a price that is reduced for social projects. There will be a smaller version, generating one MW, "30 percent cheaper", of identical dimensions, but with three tons of the fluid that is biodegradable, instead of the four used in the other model. "My favorite is the solar boat, a good example of how to find solutions," said Sam Passmore, director of the Environmental Programme at the U.S.-based Charles Stewart Mott Foundation, one of the meeting's eight international sponsors. 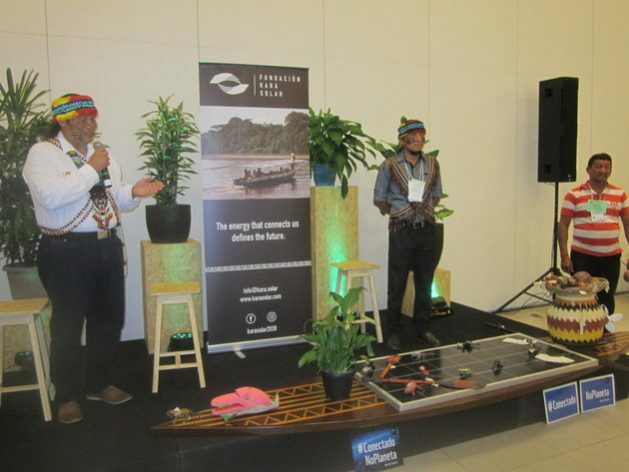 Kara means dream in the Achuar language and it is about maintaining the sustainable culture of river transport, as opposed to "the roads that threaten our territory, presented as if they represented development," project coordinator Nantu Canelos told IPS during the fair. "We want to build 300, 400 solar boats," said Milton Callera, technical director of the Coordinating Committee of Indigenous Organisations of the Amazon Basin (Coica). Riverside dwellers and indigenous people in Brazil are also seeking to "solarise" their boats, especially the small ones, dedicated to fishing and the transportation of a few people. The problem is where to put the solar panels on the so-called "flying boats", without slowing them down. The discussions at the symposium, however, focused on the need to universalise energy. "There are still 500,000 people, or 100,000 families, without access to electricity in Brazil's Amazon region," according to Paulo Cerqueira, coordinator of Social Policies at the Ministry of Mines and Energy. "The Amazon is a great market for those who don't mind long trips and can work in places that are difficult to access," a company technician told IPS. That's why he founded the I9SOL Institute, where the "9" stands for innovation. "The main obstacle is the import of photovoltaic cells, which Brazil does not produce and which has to pay too high a tariff, because of a strange legal measure adopted in 2012," he lamented. In addition to this, there are two industrial processes for processing silicon, and "the rest is packaging work that trained people can do without difficulty," he said, before pointing out that this continues to be the case in China and India, which provides employment for millions of workers, especially women. Railton de Lima, the inventor of the Eletro Roda, which he called a "voluntary engine for mechanical energy generation," also developed a system for converting urban waste into charcoal briquettes to generate electricity, making it easier to recycle metals. This technology is already used in several Brazilian cities, including Manaus. Of Lima's 28 inventions, more than half are already being used in the market, and others are being developed for energy purposes. "The idea of the right to energy is powerful" and stimulates solutions, said Passmore of the Mott Foundation. In the same sense, the diversity of peoples and communities represented at the Manaus meeting was "a very positive factor," he concluded.